Weight: 11.11 ct; size: 16.22 | 12.25 | 7.25 mm; shape: octagon; colour: dark reddish orange; clarity: eye clean; cut: fair; treatment: none. Very clean specimen; step cut style. 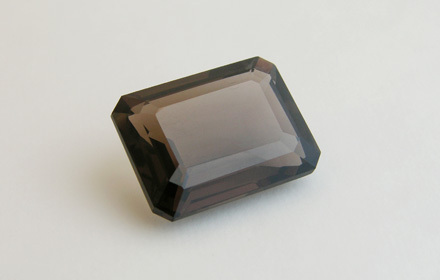 Smoky-grey, brown to black quartz coloured by Al-based and irradiation-induced colour centres.